Mounting evidence educational psychology research indicates that when students see the value of their schoolwork—how it relates to what they care about and can help them reach their goals—they become more interested in their classes and motivated to take on challenges. However, developing this “value mindset” can take time for many students, especially for those who have faced repeated setbacks in school or have felt disconnected from traditional curricula. In the fall of 2016, teachers at High School of Telecommunication Arts and Technology (HSTAT), who had seen many of their students continue to struggle academically despite trying a number of interventions and strategies, decided to focus on this question: How might we help students see the value of their learning as a way to increase their motivation and persistence? 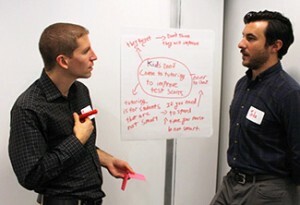 Through their participation in the Advanced Academic and Personal Behaviors Institute (AAPBI), a program through the New York City Department of Education’s Office of Postsecondary Readiness, a team of teachers including HSTAT English and leadership teacher Matthew Raphaelson, began working with Eskolta facilitator Katie Gleason to explore why their students were struggling to make progress. To do so they first conducted a mindset survey with select students. Based on data from the survey, Raphaelson found that, while students in his eleventh-grade leadership class indicated that they felt a sense of belonging in school and believed that effort could lead to improvement, they were struggling to see value in their schoolwork. These findings gave Raphaelson the impetus to develop weekly lessons designed (see example at right) to purposefully help these students make connections between class content and their lived experiences. By using restorative circles, an intervention that allows students to build relationships, gain emotional support, and express themselves, Raphaelson merged two kinds of content into his lessons—material from subject-area classes and material from students’ passions outside of school—which helped students feel more connected and value the lessons on a deeper level. As a result of these lessons, several students’ mindsets have started to shift as they have shown an increased recognition of the connection between their learning, their lives today, and their lives in the future. 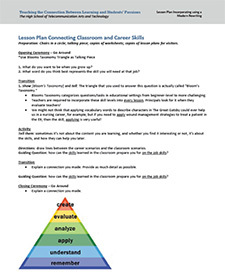 After iterating on the design of these lessons, Raphaelson created a “starter kit” of the strategies he piloted as a resource for other teachers to implement mindset practices in their own classes. He hopes it will serve as a model of how to test out small changes in classroom practices and reflect regularly on the effectiveness of those changes to improve lessons and ultimately student outcomes.